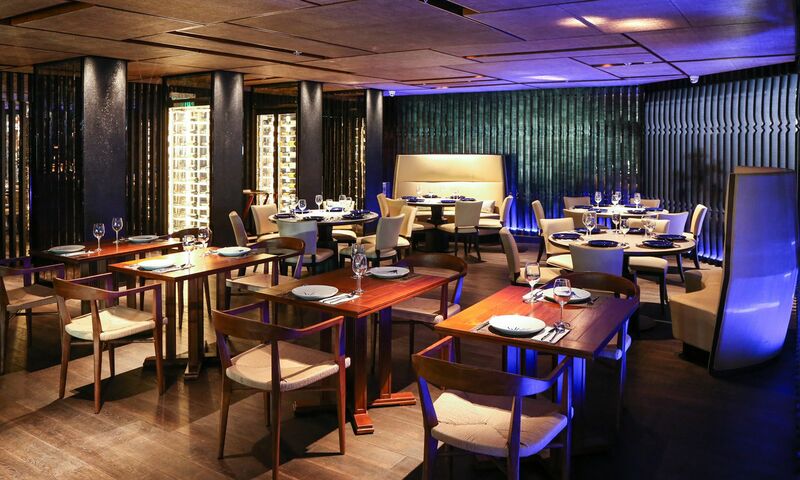 Blue Elephant is tucked away at one end of Harbour City, but its discreet entrance belies an expansive space within. The 150-seat restaurant is divided into the main room, where tables are laid for smaller groups, and a narrow gallery with larger tables set against the sea view. The interior is modern with dark wood embellished with indigo accents throughout the restaurant. From the intricately hand-drawn mural at the entryway to contemporary touches such as floor-to-ceiling wooden panels separating two dining areas, Hong Kong’s branch of this popular establishment strays slightly from its colonial beginnings yet staying true in offering comfort and great ambience to the restaurant. The Blue Elephant group is celebrated for its line of spice pastes and seasonings and it shows its menu offerings. We started with the deep fried fish cakes - the dainty patties of minced fish and pork, seasoned with red curry paste were deep-fried until golden brown and served with a sweet and sour dipping sauce. The young papaya and squid salad was a generous portion of grilled squid ringlets weaving through finely shredded green papaya, tossed with a refreshing dressing. We enjoyed individual servings of the king prawns tom yum goong and free range chicken tom kha, both served atop earthenware braziers. The heat of the tom yum goong was balanced by a rich mélange of Thai aromatics that included earthy galangal, lemongrass, and fragrant kaffir lime. The tom kha - coconut chicken soup was cloying on the palate. Seafood mains are popular choices at Blue Elephant but we opted for the signature Massaman beef, arrived in a traditional Thai clay pot that appeared petite but yielded a generous quantity of sumptuous fork-tender beef cubes in a mildly sweet dry curry, served atop caramelized purple sweet potatoes. The rich, long-cooked curry would be perfect for steamed rice or roti. The stir-fried rice noodles with pork neck and vegetables was an agreeable alternative to the traditional phad thai; the noodles could have used a longer stir-fry as they were still stuck together, but the dish was confidently seasoned with the pork neck pleasingly crunchy. Blue Elephant offers a number of desserts including their playful version of that quintessential Thai dessert, mango sticky rice. We opted however for the lemongrass soufflé which was delivered properly risen and fluffy with just the right hint of lemongrass The soufflé needed no embellishment, although an accompanying lime sorbet helped clean the palate. The beverage list is far is stronger on cocktails and mocktails than it is on wines with only a few options offered by the glass. The signature Blue Elephant Thai Pina Colada is served very cold in a fresh young coconut and being made with coconut water, is a welcoming version of the classic mix of rum, Malibu, pineapple and coconut cream. The drink is mildly sweet and a good pairing for the starters and salads. The Butterfly Pea Drink is the restaurant’s signature mocktail. The infusion of the butterfly pea flowers with a lemon-based soda brings a blue hue that echoes the indigo tones of the décor. Served tall with lots of ice, its mild sweetness is a good foil for the curries on the menu. Despite its opening late March, guests can still expect opening jitters with occasionally lengthy waiting times for main dishes and mix-up in orders, but these were promptly acknowledged and addressed. Service can be a bit hit-or-miss, but the staff are an enthusiastic team and knowledgeable on the establishment’s menu offerings; dishes are competently described, ingredients ably identified and with further descriptions given of the origins of some ingredients. Drinks suggestions were appropriate as well. A dinner for two including one beverage each amounted to HK$990. With the setting and food offerings being squarely on point, the new establishment needs improvement on service to ensure customers’ returning visits.